Blueberries help maintain healthy bones: Blueberries contain, iron, phosphorous, calcium, magnesium, zinc and vitamin K which all contribute to building and maintaining bone structure and strength. Iron and zinc play crucial roles in maintaining the strength and elasticity of bones and joints. They can lower blood pressure: Maintaining a low sodium intake is essential to lowering blood pressure. 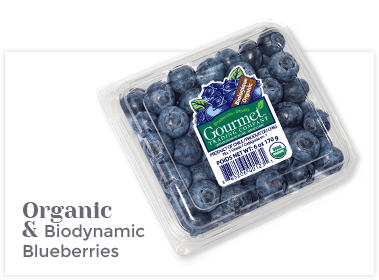 Blueberries are naturally free of sodium and contain potassium, calcium, and magnesium, all of which have been found to decrease blood pressure naturally. Blueberries help manage diabetes: Studies have shown that type 1 diabetics who consume high-fiber diets have lower blood glucose levels and type 2 diabetics may have improved blood sugar, lipids and insulin levels. 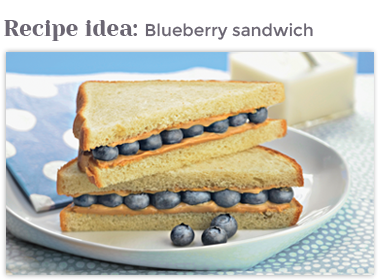 One cup of blueberries contributes 3.6 grams of fiber. 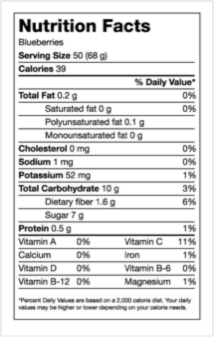 The Dietary Guidelines for Americans recommends 21-25 grams of fiber per day for women and 30-38 grams per day for men. They help warding off heart disease: The blueberry’s fiber, potassium, folate, vitamin C, vitamin B6 and phytonutrient content, coupled with its lack of cholesterol all support heart health. The fiber in blueberries helps lower the total amount of cholesterol in the blood and decrease the risk of heart disease. They help prevent cancer: Vitamin C, vitamin A, and various phytonutrients in blueberries function as powerful antioxidants that help protect cells against free radical damage. They inhibit tumor growth, decrease inflammation in the body and help ward off or slow several types of cancer, including esophageal, lung, mouth, pharynx, endometrial, pancreatic, prostate and colon. They improve mental health: Population-based studies have shown that consumption of blueberries can reduce the risk of cognitive decline as well as Parkinson’s disease – a neurodegenerative disorder resulting from cell death in parts of the brain. Studies have also revealed that in addition to reducing the risk of cognitive damage, blueberries can also improve short-term memory loss and motor coordination. Help promote weight loss and satiety: Dietary fiber is commonly recognized as an important factor in weight loss and weight management by functioning as a “bulking agent” in the digestive system. High fiber foods increase satiety and reduce appetite, making you feel fuller for longer and thereby lowering your overall calorie intake. Blueberries fight wrinkles: Collagen, the skin’s support system, relies on vitamin C as an essential nutrient that works in our bodies as an antioxidant to help prevent damage caused by the sun, pollution and smoke. Vitamin C also promotes collagen’s ability to smooth wrinkles and improve overall skin texture. Just one cup of blueberries provides 24% of your daily need for vitamin C.
They should appear round, firm, tight and without dents.